As a special bonus to Konami month, here is the Silent Hill 3 HD remake. Nothing makes certain sections of the internet more salty than the subject of the Silent Hill HD collection. People have made 2 hour long documentaries detailing every single flaw, every line of dialogue, and every speech inflection that has been changed and how it makes these versions terrible. It is beyond picky, and since there is a full on review of Silent Hill 3, I’ll focus on the HD remake and whether it is fine or not. In SH3HD it is fine. I didn’t really notice any difference in terms of lighting, the textures are a more refined, and the game is a little more “HD” than the SH2HD version was, but it does run at the bottom end (720) of the HD spectrum. Unlike Silent Hill 2 HD, there is no option to use the original voices as Konami had lost all the code. I don’t have a strong issue with the voices, they are different. To the lay person you’ll only notice the changes if you line them up side by side. They are not broken, but there are a number of subtle, and not-so-subtle changes that I didn’t notice playing the HD version straight after the normal version. The only thing I noticed is that Heather has more of the annoying “high rising terminal” where you end a sentence as though it is a question, and that she does sound a little bit more like a bratty high-schooler, but I doubt 99% of the people out there will notice, but maybe you are one of those that likes pitchforks and internet hating. My major concern with the game is the controls for the 360 version. It can make speed running next to impossible, and it totally fucked my ability to do a no save run. I died 3 times by falling off the edge on medium. For starters, you shouldn’t be able to fall off the edge on medium, that is a hard setting thing. But, the controls are really sloppy. If you even nudge the analogue stick or dpad slightly in a direction, Heather will lurch uncontrollably with a 90degree pivot. This is especially hard on the narrow tracks in the Amusement Park, but also in the Alternate Church in the areas with the elevator. In both these areas I died because the controls freaked out and sent me over the edge both metaphorically, and literally. I don’t know if I just failed to trigger it, but some of the Silent Hill 2 references didn’t seem to work. Specifically the toilet scene, and I did find some of the text didn’t match up to the PS2 version, so my guess is that is the default text appeared rather than the SH2 reference.. There is an upgrade in texture quality, but there are a number of pretty bad graphical glitches, especially around Heaven’s Night entrance. Meaning any upgrades are countered by some pretty poor bugs. The controls however are fucked. and can be game breaking at times. 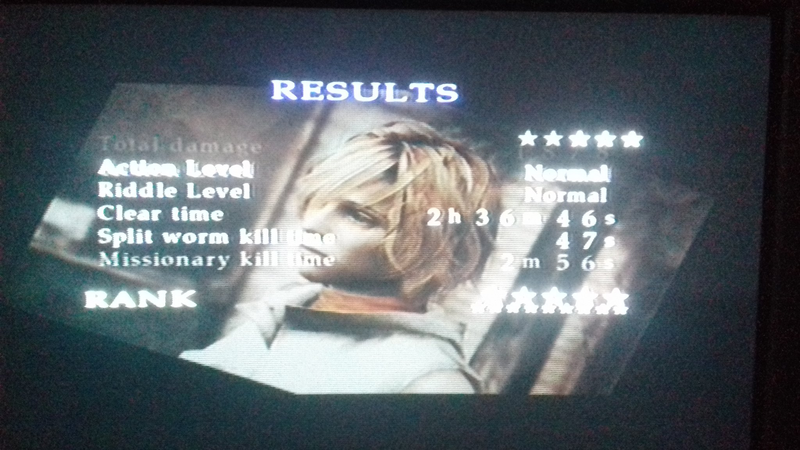 Ultimately though, SH3HD is still Silent Hill 3, so you still get a decent experience but with pretty bad controls. If you don’t have a PS2 this version will suffice and will work as a surrogate to the original, but like SH2HD, this is an inferior port. Pros: Better than the SH2HD version. You also get SH2 on the disc.